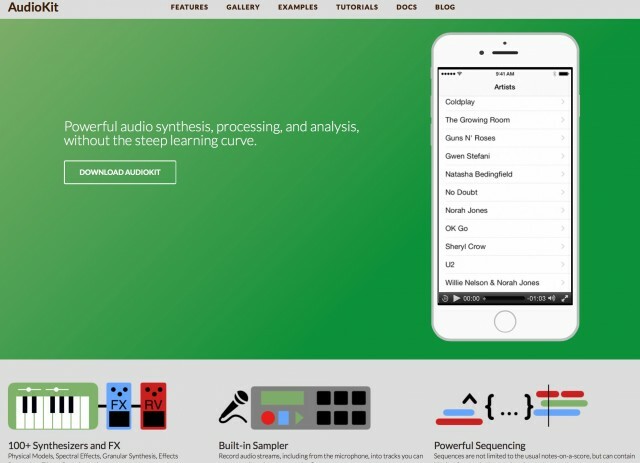 AudioKit is a promising-looking new open source tool set for coding synthesizers, music, and sound on Apple platforms (though it could certainly be ported to other places if you have the time). 100+ synths and effects, including physical models, spectral effects, granular synthesis, reverbs, etc. Built-in sampling, complete with recording and storage functionality. Sequencing you can trigger from code. Examples with granular synthesis, convolution, effects processing, pitch-shifting, and more. Sound code you can integrate with your app logic. AudioKit for Game Audio: Space Cannon from AudioKit on Vimeo. Add this to libpd, plus the weekend’s announcement of a new sync library, and it’s clear that free software and open source tools can coexist with Apple’s proprietary platform. At the risk of offending more rigid free software zealots, I think that’s only a good thing. It promotes coding literacy and self-sufficiency, and it demonstrates the flexibility, durability, and power of free software licenses to help people work together to solve problems. That can only encourage people to toy with free platforms, whether it’s connecting an Arduino or Raspberry Pi or dual-booting that Apple laptop to Linux. And having more shared code can also benefit platforms outside the walled garden. Max Mathews, we miss you; it seems you will also live forever.